Fresh, easy, and pretty enough for a party this colourful Waldorf salad tops our list of go-to recipes for a perfect side dish for a fall. With the bounty of crisp apples and crunchy walnuts this in one of our family favourites. It’s crisp & cool which is perfect for a warm fall night. This will become your go-to recipe through out the fall for backyard barbecues, family gatherings or pot lucks with your friends. Mix apples, walnuts, pecans , celery and raisins in a serving bowl. Mis the yogurt, oil, lemon juice and honey in a small bowl then toss with fruit and nuts. Cover and refrigerate for about an hour before serving. * mayonnaise can be used as a substitute for greek yogurt. Also tasty with a hint of honey. I’ve never tried a Waldorf Salad, but it sounds delicious! Fall would be the perfect time to enjoy the nuttiness of walnut and in season apples in a salad! I’ll be trying it for sure! 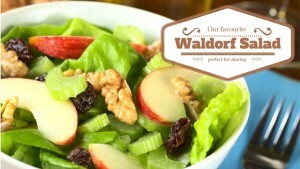 Waldorf salads are fantastic. I need to add this to my dinner meal plan . I love Waldorf salad and haven’t had one in a long time! I’m definitely making this. So good! I am a salad lover and printed down a few recipe ideas today from another site, will definitely print this one as well. My mother used to make this salad for us twice a week every summer when I was a child. It is such a nice memory for me. I have never made it myself. I would like to try your recipe and see what happens. I’ve never made one at home, but this inspires me too! I love using Greek yogurt! Oh yeah, I forgot about this kind of recipe. I love a nice Waldorf Salad! I think fall is a great time for a Waldorf salad – easy to make and a nice refreshing way to end the day. I have not had Waldorf salad since I was a little kid. I think this would be great to make for my family. Oh I haven’t made one of these and we were just talking about them. I’d love to make one for lunch this Saturday. I made this salad a week ago and ate the entire bowl for lunch. This looks super tasty! I have never tried apples on a salad before. To be honest, I was a little leary of trying fruit in a salad but the flavours are amazing together. I use to make waldorf salad a lot but usually not on a bed of lettuce just straight up. I skip the lettuce too! It has been soooo long since I made this. I will need to pick up a couple things, but will try yours for sure. I like Waldorf salad too! I’ve never made it before though so thanks for the recipe! this recipe sounds amazing. I don’t believe i have ever Waldorf salad but now I want to try some. This recipe is our favourite! I just picked up some more raisins so I can make a huge batch to go with our chicken tomorrow night for dinner. This looks so yummy! I will be giving it a try soon. Thanks for sharing the recipe! I have been trying to stick to a low carb diet. This sounds like a great way to eat a salad, changing it up a bit from a boring salad! yumm! I haven’t had Waldorf salad in years! Totally going on the menu! I love a good Waldorf salads. It’s so light and fresh and a perfect lunch. Lately I’m looking for recipes with apples since it’s apple season. I have never had a Waldorf salad. It sounds really yummy!